Generous funding from the Executors for the estate of the late Leslie Holland has enabled Purton Artists to establish this website. This was all made possible quite by chance. Someone was in the right place at the right time. In 2005, Anna Hirsch-Holland, who at the time was a student at the University of Oxford, was walking down Broad Street in Oxford, when she spotted a display of famous book cover posters in the window of Blackwells Bookshop. It included a poster designed by her late Granddad, Leslie Holland. It was of the 1932 edition of Brave New World by Aldous Huxley. She bought one to put on her wall and noticed some small print on the poster saying that the company who printed it had not managed to identify the designer, even though Leslie’s signature appears faintly on the poster. She mentioned this to her father Matt Holland, who is one of Leslie’s sons. Matt contacted the company, Bookish Designs, who had printed the poster. They said it had proved to be the most popular of the 12 designs they were selling. Matt made an agreement with them for the estate of Leslie Holland to receive royalties from sales of this design. It is from these royalties that the Executors have very generously given Purton Artists some funding for the next five years. Purton Artists would like to thank the Executors of Leslie Holland's estate for their bequest in memory of him. Leslie was born in Ealing, a place he fondly referred to as ‘queen of the suburbs’. From an early age he showed precocious talent, with a pencil. He had a real and natural gift for drawing, for close observation, and for recognising the power of line. He did also like dressing up and playing the part of romantic heroes in homespun performances with his brother Gordon, and two sisters, Dorothy and Eileen. But art remained his passion and, encouraged by his mother, who also had an eye for a good line and all things beautiful, he was soon winning scholarships. He was offered entry to a number of prestigious art colleges, including the Slade and the Royal College of Art. He chose the latter, where he enjoyed many new and inspiring friendships, benefited by hearing brilliant lecturers, including Henry Moore, and developed slice and spin that made him a ping pong player to be reckoned with. But, ever uneasy about the constraints on art when institutionalised, he left before the end of his course. Now, as a trained illustrator and skilled draughtsman, he embarked on a career as commercial artist, entering the world of illustration and design. He produced posters for London Transport, greetings telegrams for the Royal Mail, and a number of designs for book jackets, including the highly-praised cover for the first edition of Aldous Huxley’s Brave New World. But he never read the book. Despite these successes, practising his art for commercial gain was not to Leslie’s liking. He preferred to be out and about, meeting people, making connections, loving art and life, and when he could, heading for Europe to seek out its art hotspots. He told of meetings with remarkable artists in Frankfurt, and how, despite his real and strongly-felt pacifism, he once found himself working for a painter who was officially sanctioned by Hitler. Leslie’s quest for new experiences, combined with a certain naïve idealism, also resulted in meetings with dangerous men: Mussolini’s soldiers no less, who were suspicious of this wayward young man with his flowing beard and sketchpad always at the ready. However, from these foreign adventures, Leslie would always return home to his mother in Ealing, from where, in 1939, he was finally dislodged by a beautiful young Austrian nurse, Gerty, who became his friend, wife, and lifelong companion. Together, for their honeymoon, they walked across England, heading west, doing casual farm and garden work on the way. In years to come, this chapter of Leslie’s life provided a rich source of stories, about life in a gipsy caravan that was washed away by floods; picking sprouts in freezing weather; making home in a cricket pavilion that burned down while he and Gerty were out shopping; and their discovery of the Bruderhof, comprising a group of people of many nationalities on a farm in Shropshire living and working together and having all things in common in the spirit of the early Christians. This was a way of life, with its mixture of daily challenges, companionship, and joy, where men and women called each other brother and sister and sang songs at meal times, where work and life was communal, and where luxuries were scarce but all basic needs were met, that suited Leslie well. In fact, it called to him, to join, and remained a lifelong source of strength and joy. It also took him, Gerty, and their six young children, across the sea to South America, to a new home in deepest, wildest but beautiful rural Paraguay. The simple but colourful and always challenging life there provided new impetus and excitement for Leslie’s drawings and paintings, even though his daily work was mostly in the community’s extensive vegetable gardens, hoe in hand under the hot tropical sun. His drawings from this time, that so realistically and lovingly illustrated everyday community life and ‘all good things around him’, became a joy to everyone who saw them, and were later used to illustrate a book on the Bruderhof in Paraguay. By the early ‘sixties, Leslie found himself back in England, looking for work to help support his big family. He found it, not through formal qualifications that he did not possess but thanks to his love for art and people, his natural and given gifts. Teaching school children in Cricklade; making friends in Purton, which was to become his home for the next forty years, illustrating the village magazine and being the artist in residence for the Swindon Festival of Literature; painting a picture of The Last Supper for his village church St Mary’s when their original was stolen; telling the best stories often about the smallest things; filled daily with the joy of living; being a loving husband, fascinating father, groovy grandfather and great grandfather, and drawing, drawing, drawing, everywhere he went, all this drew Leslie to life. Biography provided by Matt Holland. 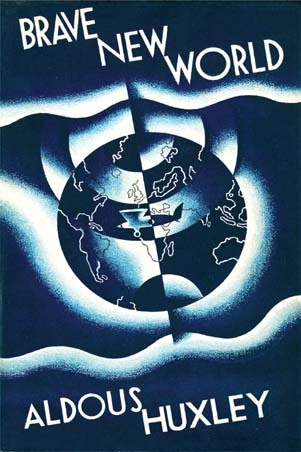 Copyright of the Leslie Holland first edition book cover work ’Brave New World’ is owned by the Holland family who have allowed its use by Purton Artists Society for promotional purposes.